Ole Hansen was a living ledged in Denmark and was known both as the “King of Tattooers” and the “Tattooer of Kings,” referring to the work he did on His Majesty Frederick IX, King of Denmark. The story goes that Ole went to sea at the tender age of 14 and started tattooing 4 years later. During World War II he fought in Europe and North Africa, tattooing all the while from a portable outfit. 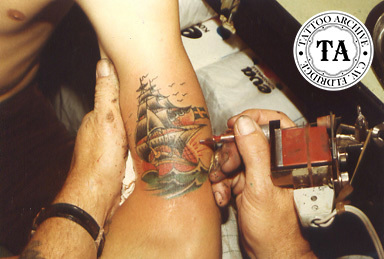 In 1947 when he bought Tato Jack’s shop, Ole moved into one of the oldest tattoo shops in the world--the already famous No.17 Nyhavn in Copenhagen. Ole said there had been tattooing at that location for 100 years! Ole himself spent 40 years at that shop and in that time became a well-respected and beloved artist. Ole built his own tattoo machines which had many unusual features including sealed coils, short tubes, finger-tip on and off switches and plug-type electrical connectors. Terry Wrigley recalled that in the 1950s, Ole was approached by a famous bubble-gum maker. They wanted Ole to draw a set of designs to be made in miniature transfers, which would be given away with their gum. This gum was still available in the 1980s and continued to include Ole’s designs. 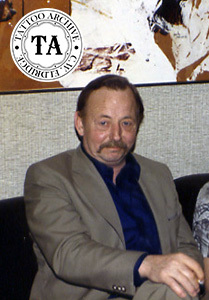 Ole Hansen died in 1988.